Conducted annually for more than 30 years, the J.D. Power Initial Quality Study (IQS) is an automotive industry benchmark measurement of new-vehicle quality. Based on survey responses from people who have owned their new vehicles for at least 90 days, the IQS measures owner-reported problems with design and defects. Derived from this information, Power Circle Ratings summarize the findings of the IQS in a simple manner. When consumers shop for a new vehicle, these ratings, which are visual representations of the overall findings of the study, can help to guide them as they conduct their research. This buyer’s guide contains the top-rated 2018 Family Cars for Initial Quality. Each model earned a Power Circle Rating of 4 or 5 out of a possible 5 for initial quality during the first 90 days of ownership. Chevrolet’s full-size car sees few changes for 2018. Offered in LS, LT, and Premier trim with a 4-cylinder or a V6 engine, the Impala features a huge interior, a giant trunk, and significant value. The 2018 Chevrolet Impala receives an Initial Quality Power Circle Rating of 4 out of 5. A midsize sedan with stylish looks and competitive packaging, the Chevrolet Malibu is offered in L, LS, LT, Hybrid, and Premier trim levels. Buyers select between a 4-cylinder engine, a turbocharged 4-cylinder engine, and a hybrid drivetrain EPA-rated to return up to 46 mpg in combined driving. For 2018, a sporty Redline Package is newly available. The 2018 Chevrolet Malibu receives an Initial Quality Power Circle Rating of 4 out of 5. Chrysler’s full-size sedan returns with a revised trim level lineup for 2018. Base trim is now called Touring, with Touring L, 300S, 300 Limited, and 300C serving as upgrades. The rear- or all-wheel-drive car continues to provide a choice between V6 and V8 power plants. The 2018 Chrysler 300 receives an Initial Quality Power Circle Rating of 4 out of 5. Ford’s midsize Fusion sedan offers plenty of variety. Trim levels include S, SE, Titanium, Sport, and Platinum. Various normally aspirated and turbocharged 4-cylinder and V6 engines are available, as well as optional all-wheel drive. Hybrid and plug-in hybrid drivetrains are also offered, the latter providing an estimated 21 miles of electric driving range, and more than 600 miles of total driving range. No changes are made to the 2018 Fusion, and Ford plans to discontinue the car when this version runs its course. The 2018 Ford Fusion receives an Initial Quality Power Circle Rating of 4 out of 5. A full-size sedan with a massive trunk, the Ford Taurus is available in SE, SEL, Limited, and SHO trim levels. A 3.5-liter V6 engine is standard, all-wheel drive is optional, and the sport-tuned SHO version gets a twin-turbocharged V6 and standard AWD. Ford makes no changes to the 2018 Taurus, and has announced that it will discontinue the car soon. The 2018 Ford Taurus receives an Initial Quality Power Circle Rating of 4 out of 5. Hyundai gives its midsize family sedan a thorough mid-life freshening for 2018. Highlights include new styling, improved driving dynamics, added standard equipment, more safety technologies, and three free years of Blue Link services. Turbocharged, hybrid, and plug-in hybrid powertrains are available as upgrades from the standard 2.4-liter 4-cylinder engine. The 2018 Hyundai Sonata receives an Initial Quality Power Circle Rating of 4 out of 5. Offered with five different powertrain options, the Kia Optima is a midsize sedan that serves many requirements. The standard engine is a 2.4-liter 4-cylinder. Upgrades include a pair of turbocharged 4-cylinder engines, a hybrid drivetrain, and a plug-in hybrid option. Trim levels include LX, EX, SX, and a new S trim that provides a sporty but affordable model for bargain hunters. The 2018 Kia Optima receives an Initial Quality Power Circle Rating of 4 out of 5. 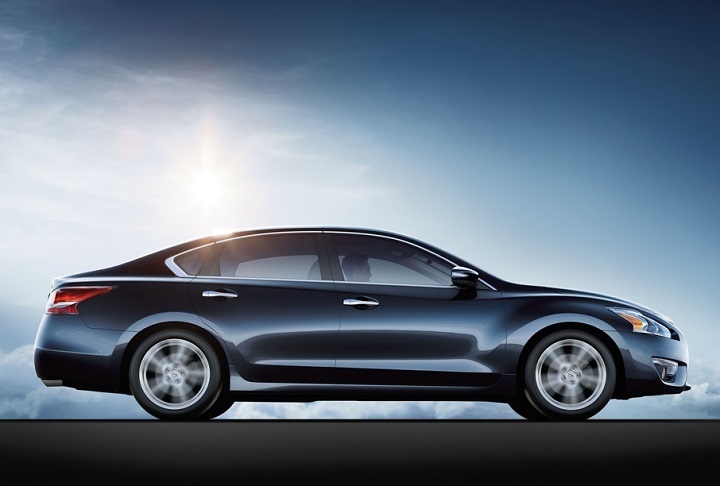 In its final year before a complete redesign, the Altima proves itself to be the highest quality car in its class. This year, forward collision warning and automatic emergency braking are standard on all models, new option packages are available, and the trim lineup shrinks. Buyers select from S, SR, SV, and SL trims, all with a 4-cylinder engine. A V6 is available, only with SL trim. Nissan also offers both Special Edition and Midnight Edition versions of the sporty SR trim. The 2018 Nissan Altima receives an Initial Quality Power Circle Rating of 5 out of 5 and receives a quality award in the Large Midsize Car segment. Nissan’s “4-door sports car” returns for 2018 without significant changes. Buyers select between S, SV, SL, SR, and Platinum trim levels, each equipped with a 3.5-liter V6 engine, a continuously variable transmission, and front-wheel drive. A Midnight Edition Package is available with SR trim. The 2018 Nissan Maxima receives an Initial Quality Power Circle Rating of 5 out of 5 and receives a quality award in the Large Car segment.